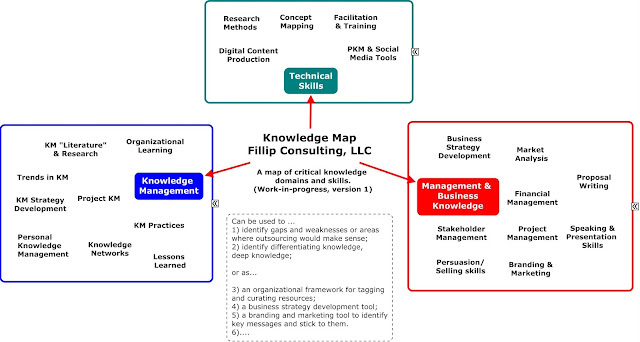 Here is a draft knowledge map for my own independent consulting (planning) effort. In my case, I'm not thinking in terms of knowledge "at risk" but rather in terms of strengths and weaknesses, areas I might want to strengthen and areas that help me differentiate myself from the competition. 2. Knowledge management knowledge since it is the domain where I am a subject matter expert; and 3. Technical skills that are essential for the successful delivery of the consulting services I want to focus on. A variation of this could also be used as a taxonomy for my internal lessons learned. If these are critical knowledge domains, it would make sense to document lessons and/or good practices over time using a consistent scheme. I will want to revisit this map regularly and adjust it. It's a work-in-progress document. Such a map is much easier to develop for an organization of one, but it helps to demonstrate some key principles that apply regardless of the size of the organization. It can be developed at the project or team level, and within individual business units.